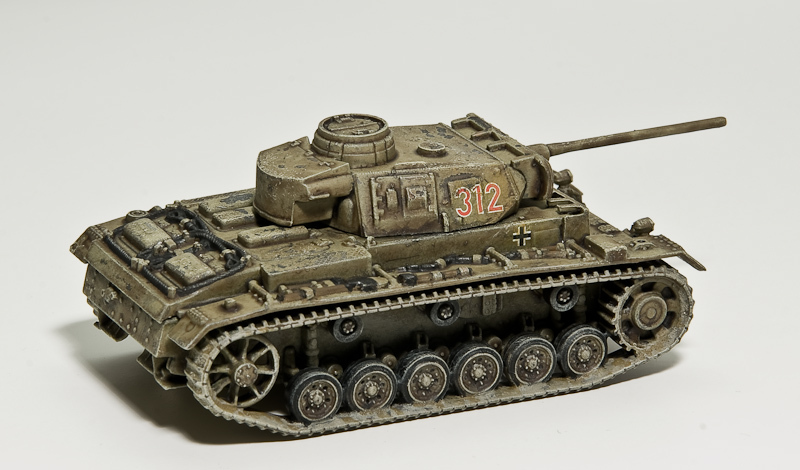 This two Panzers I finished today. I’m quit satisfied with result, especially as they are the cheep fast assembly one’s from Italeri. 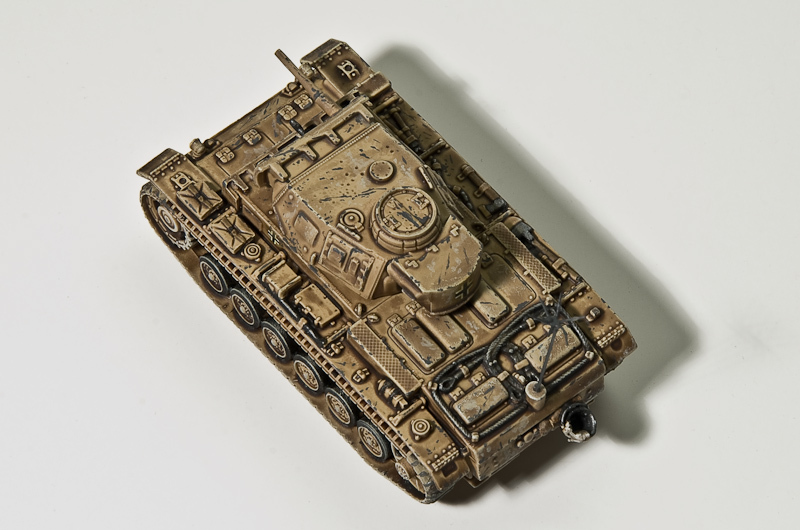 They are painted using two different techniques to achieve the weathering effect. 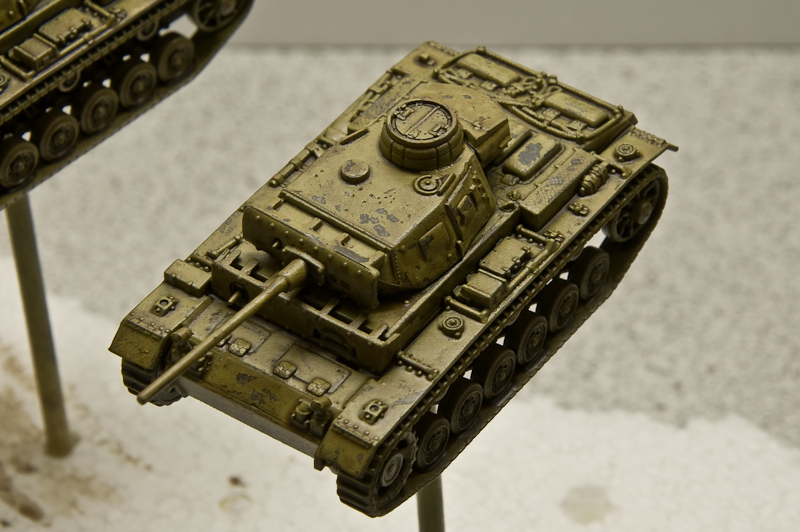 On the Panzer III Ausf. 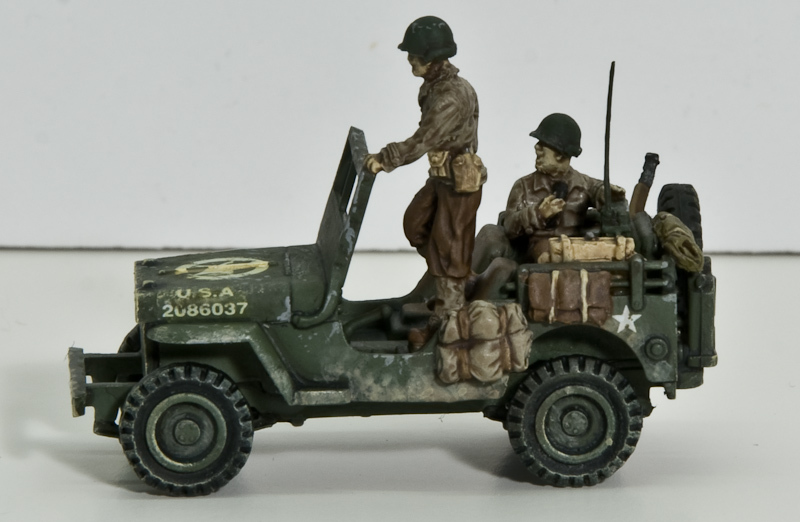 J I used the Hairspray technique and on the PzBeobWg III i just used a thin brush to paint chips on to the vehicle. 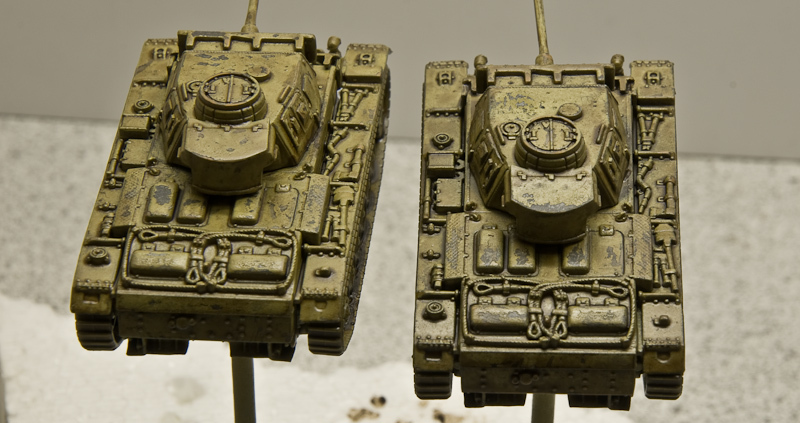 Both models has been washed with Army Painter’s Quickshade, and after that got a drybrush. 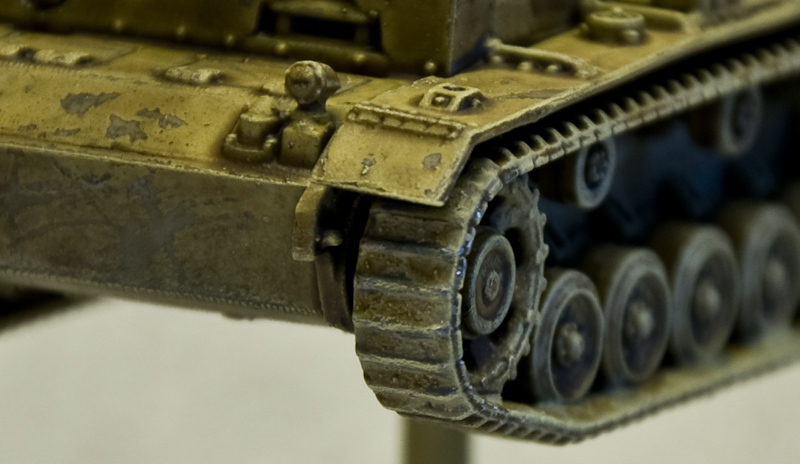 Read more about the painting and conversion of this tanks here! 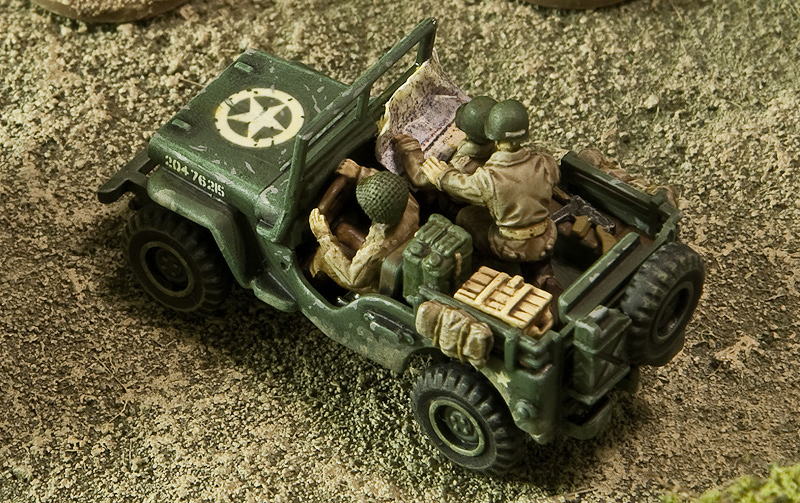 Weekend – this means that I have been able to use a few hours in a row to finally get the last things right on this Jeep. 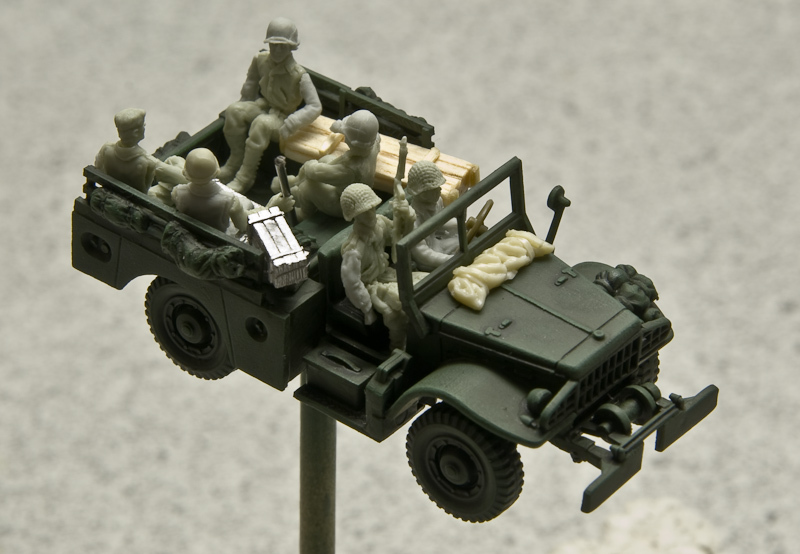 It is supposed to be a radio team that mainly will be used as forward observers for artillery support. 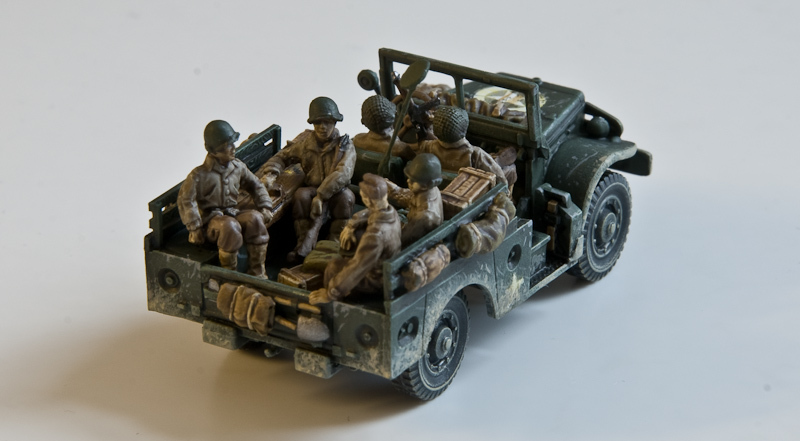 The figures are Milicast, they are not as detailed as the other Milicast figures I have used, they look a little bit retarted, especially the driver. 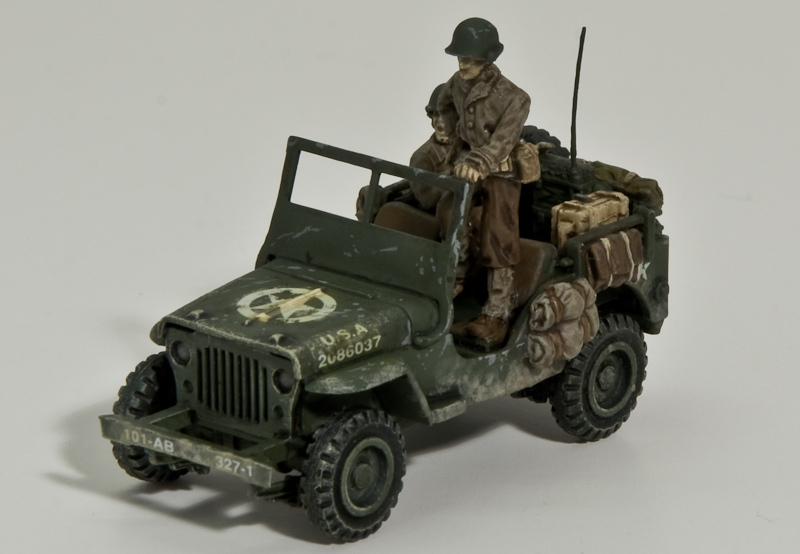 The radio is one that you get along when buying the crew, the same with the the radio operators M1 Garand rifle. All bags and bedrolls are from SHQ. The chipping is mostly done with a thin brush, but also with a sponge. The decals has been colored a little bit with some yellow acrylic colour thinned with lots of water. 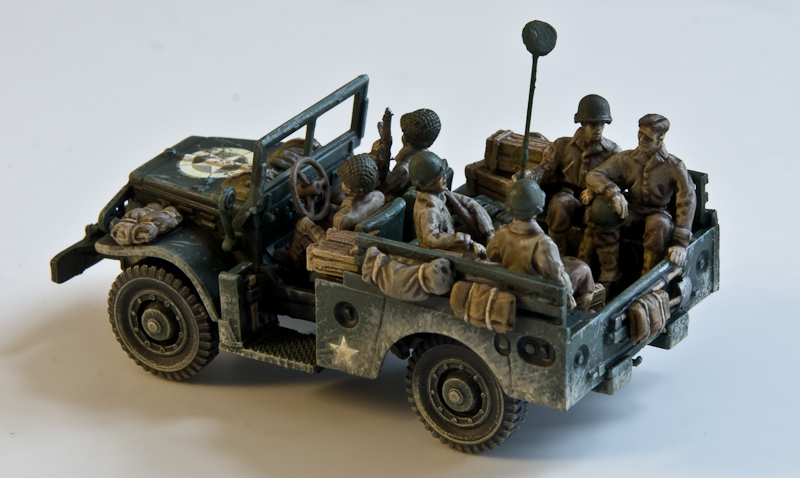 The figures and stowage I painted using the “Dip methode”. 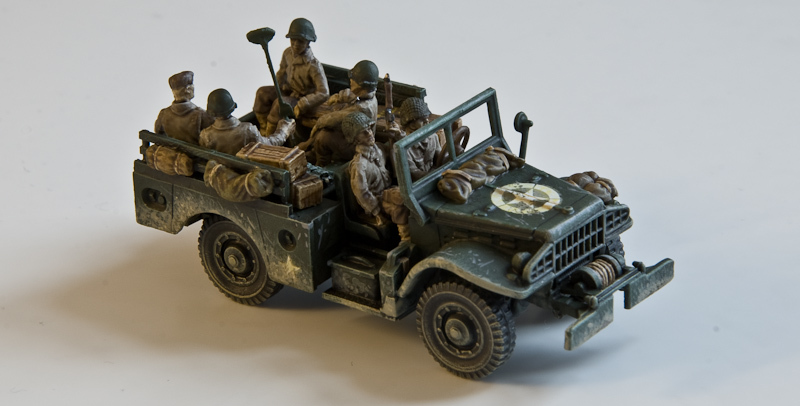 The Jeep I first spraypainted and when dry I gave it a wash made out of water, washing liquid (to remove the surface tension), black and brown acrylic colours. 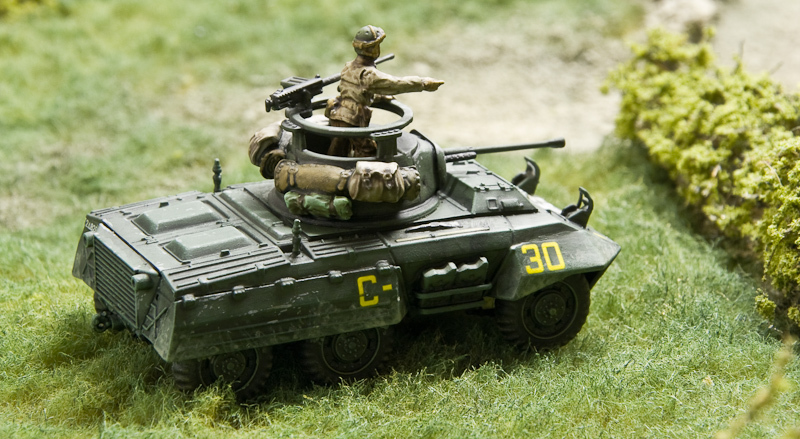 The whole model have been painted with a matt cote, both for protection but also to make it look more realistic. This will be the unseated figures. They are both AB Figures. I have always known that the Invasion of Normandy was big – very big. I also know that the British, US and Canadians fought against the Germans. I know that Rommel had the task to prepare the defences on the beaches and when the invasion started there was really hard fights on the beaches on through the bocage. I knew that the english fought hard to take Caen and that the coalition launched a operation called Cobra. But I didn’t know about almost any details, I wasn’t sure how long they fought, didn’t know how strong force the german had. I didn’t have a clear image of how the troop movement was or anything else… This has been a big problem for me. 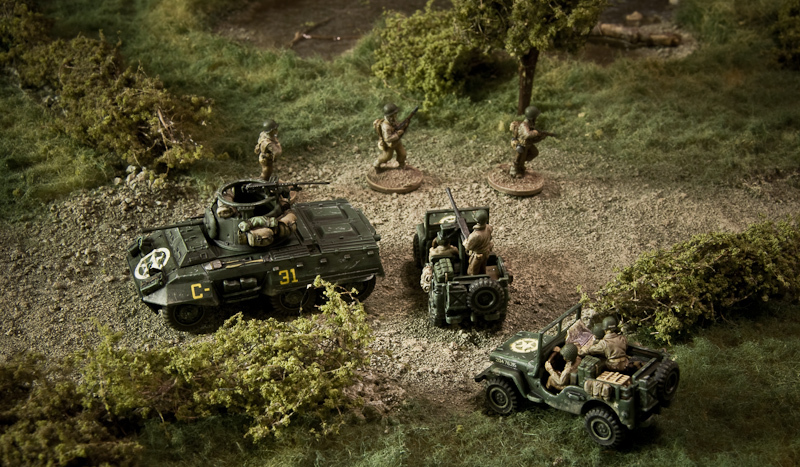 I have tried to read Osprey’s Normandy book and must say that didn’t give me very much information of that kind that I afterwards have the feeling of really understand the campaign. I while ago, when I started my Normandy project, I found a book that should have some good maps in it, so I bought it without really knowing what I was buying. I started reading it as soon as I got it with the mail. I found out that this was what I have been looking for – a very well written and easy to understand description of the whole Normandy campaign. 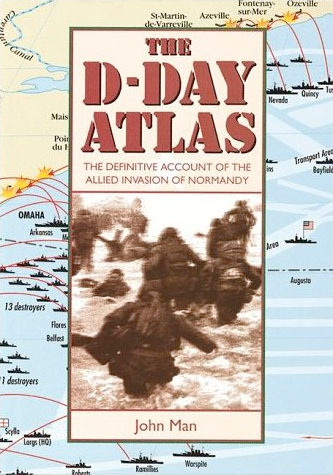 For anyone that want to know more about the D-day (and lots of days before and after) this is the book you have been looking for. 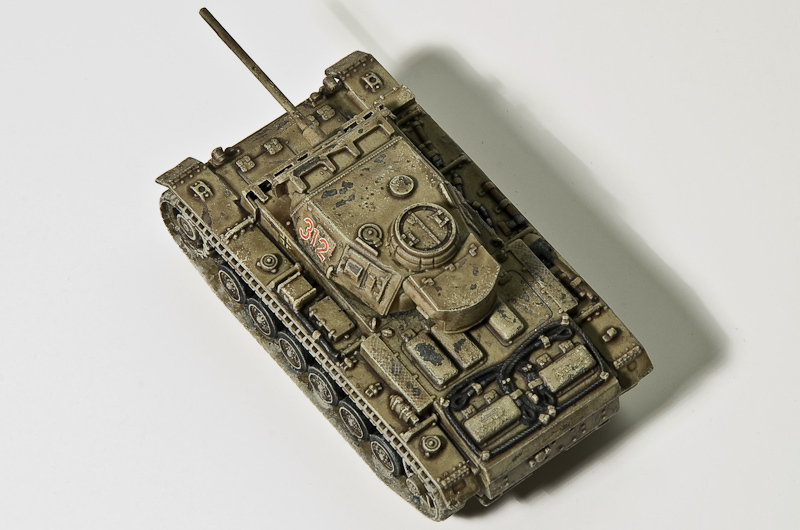 I will need some Panzer III’s in my Sicily campaign. 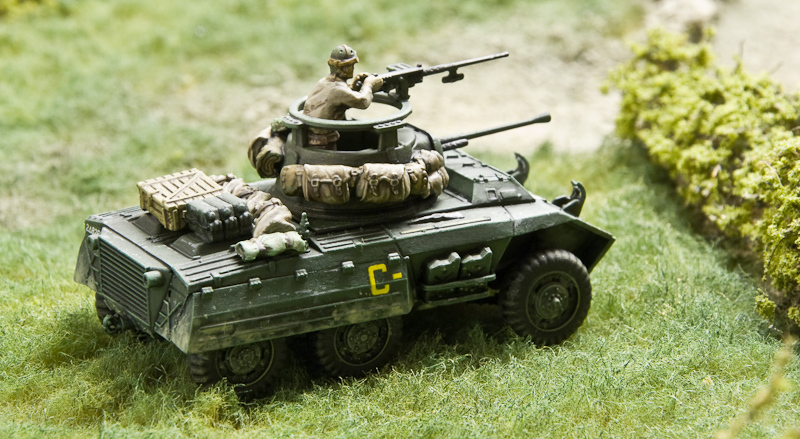 A couple with 50mm gun, one with the short barreled 7.5 cm gun and a PzBeobWg III. 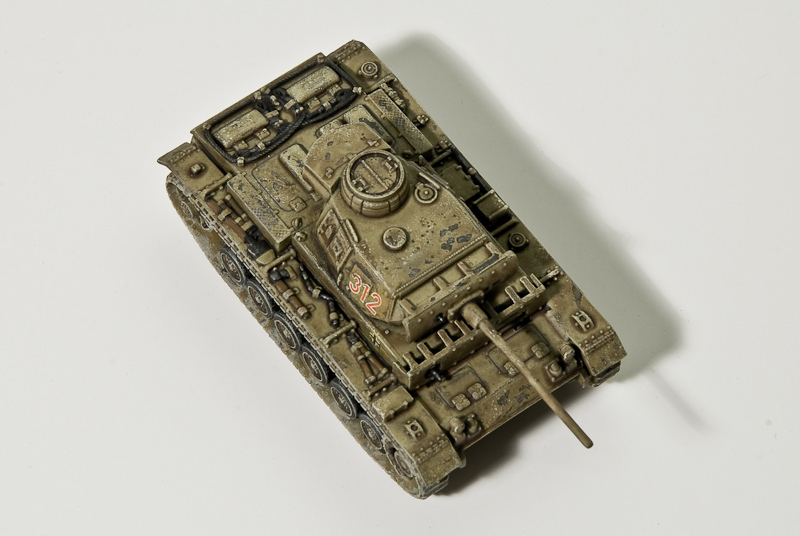 I bought two boxes of Italeri’s splendid “fast assembly 2in1 box” models, the only negative thing I can say about them is that the tracks aren’t very detailed, but I guess that this can’t be different when using that few parts on a model. 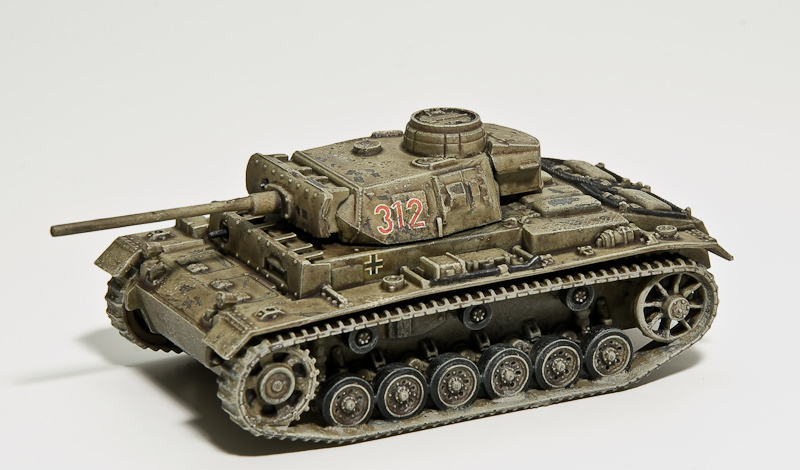 Two of the tanks was not converted, the third that will be converted into the PzBebWg, and the last I will convert to a Flammpanzer (to my Normandy project). 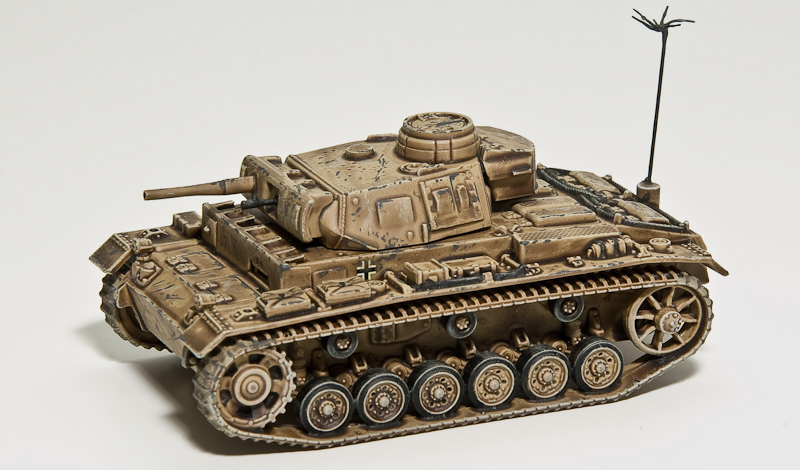 Beside the fast assembly tanks I bought one more Panzer III from Italeri (the Pz.Kpfw. III Ausf. M/N). 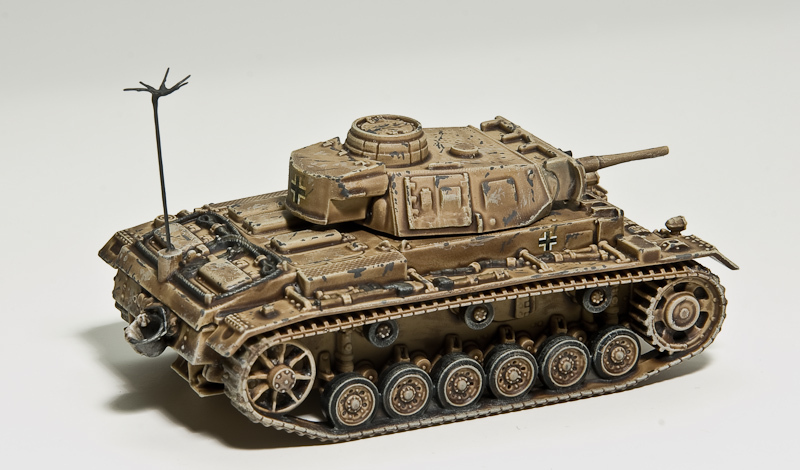 This is a great model because it comes with both the short barrel and the long one, but also a Flammethrower barrel which I will need to my Flammpanzer! 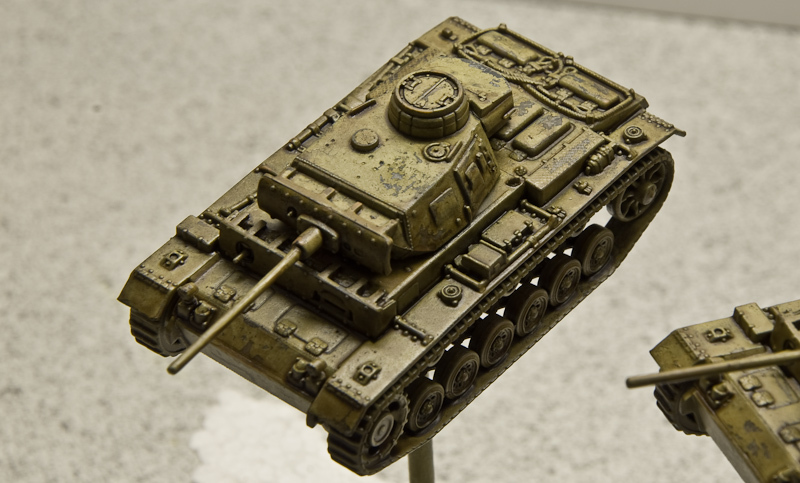 On two of the Panzers I have done some experimenting – I used both the hairspray technique and the dipping methode (but with a brush). This is how it looks right now, still need to give them some drybrushing, and cover the ugly tracks with dust or something… I’m happy with the result, but have been through too many steps to get this far… so I don’t think I will use the hairspray technique too often in the future. The dip on vehicles seems to be a succes so that I for sure will do again. 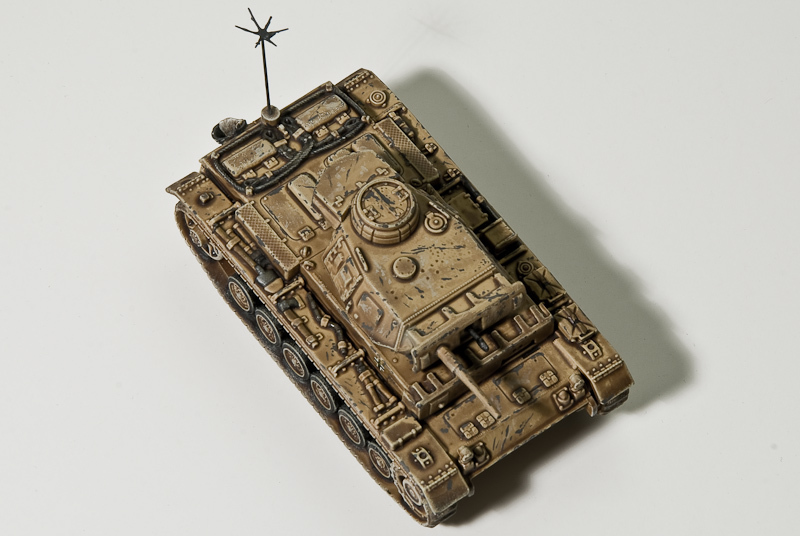 I didn’t need to do that much converting to make a PzBeobWg III. Carve some holes, sand a little bit and use some Milliput. The dummy barrel I made out of one of the spare barrels that came in the box. The antenna I will make out of a guitar string. The two lower pieces are the converted one’s, this plus adding a little piece in the back (the cylindric looking piece in back of the tank, that can be seen on the two pictures above this) where the antenna is going to be, is what I had to change to make the conversion. 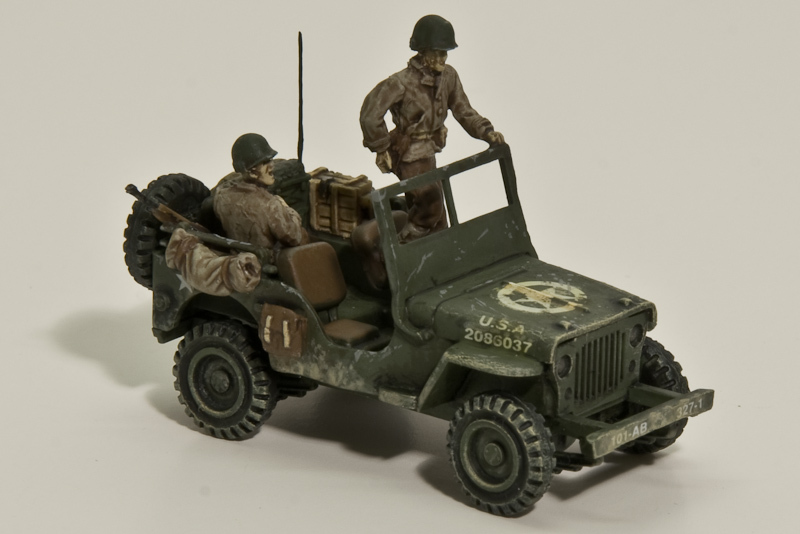 This post will be updated as soon as the vehicles is done. While my Normandy terrain project is on stand by, until me and my girlfriend moves into our new apartment (my girlfriend won’t let me use the kitchen anymore) I have thrown myself over a new project: Skirmish Elite: Combat Jump Sicily! I will skip the first missions where US fight Italians, and focus on the last 5 missions – US against Germans. 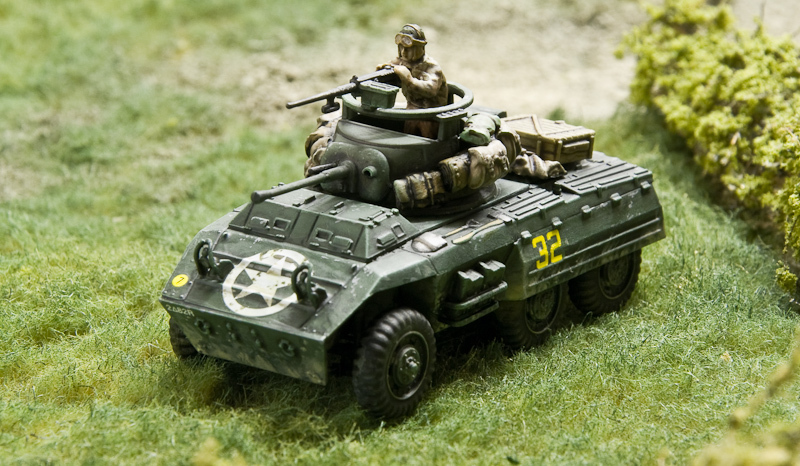 This M6 Dodge WC52 is one of the models I need to build. It belongs to a US Combat Engineer Team. 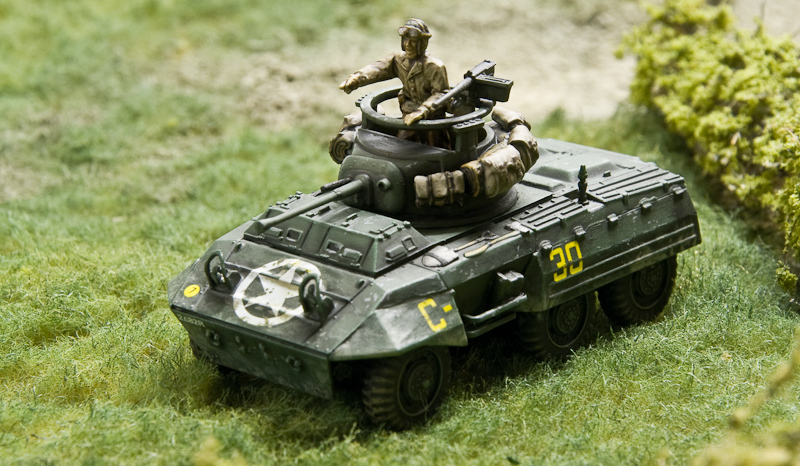 The model is converted from Italeri’s M6 Anti Tank. 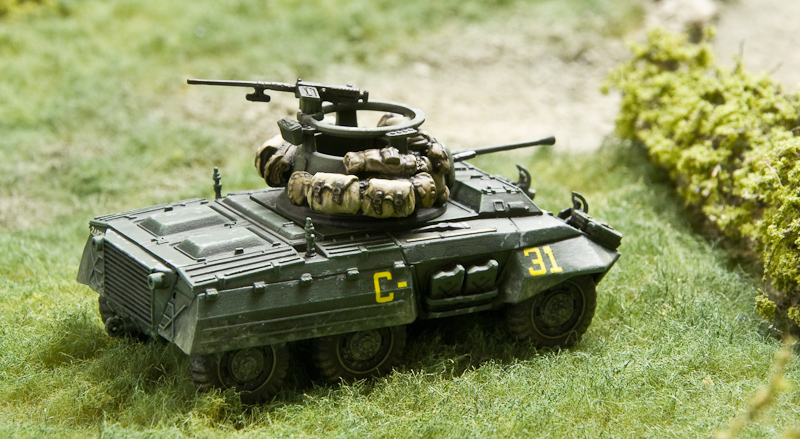 The team will carry Bangalore torpedos, demolition charges and a mine detector. A little warning to those of you that want to build this model! The wheel suspension is too high which make the truck look like a monster-truck. I fixed this by not using the models suspension at all – a conversion that is not easy, but with some patience it can be fixed. Figures are Milicast and AB Figures. Stowages from Goffy and SHQ. The Bangalore box is made out of balsa, this still need some sanding. 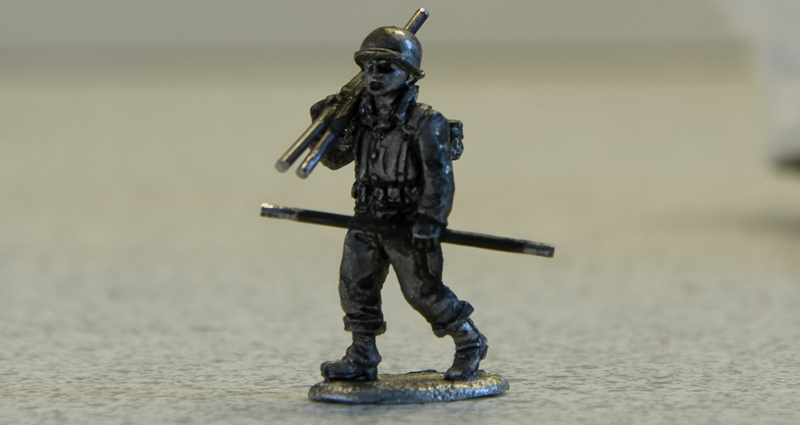 The wire in the hand of one of the soldiers will be the mine detector. 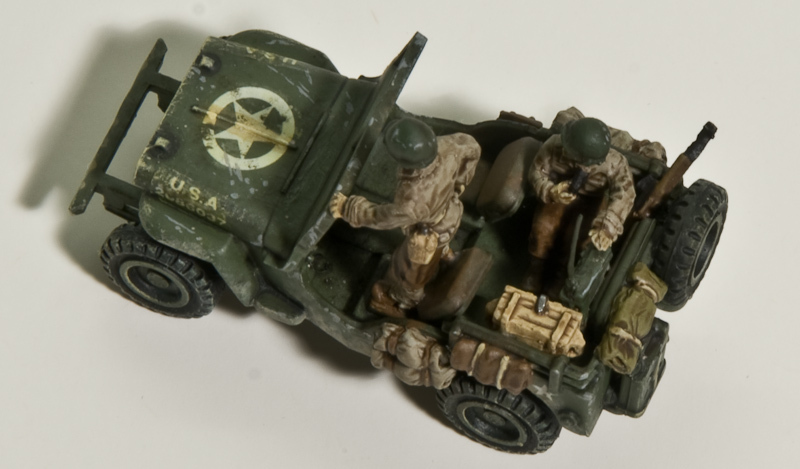 I will give the truck some drybrush and then chip it – and of course paint the wheels and all the stowage. The figures still need to be cleaned and get some milliput in the gaps where arms and heads have been glued to the body. Figures are Milicast. Stowages from Goffy and SHQ. This is the figures when unseated. The guy to the left will be converted so that he carries Bangalores instead of his weapon. They are all AB Figures. The bangalore guy got his hands full… easy task to replace the rifle with some iron wire. After I had put Milliput into holes and gaps on the figures I had lots of Milliput left. So I made the bag laying on the box back in the truck. It is supposed to look like the bag that the Mine detector guy carries along with him with some apperature in it. It is ages since I tried to create something in Milliput – it is more fun than I remember. The mine detector guys has his equipment ready. I know that the detector could be folded, but I think this way is more eye catching. 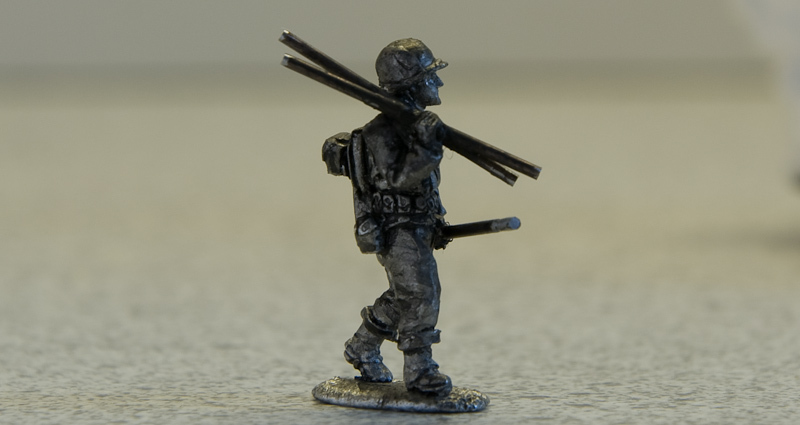 Later on I shift the wire in the mine detector to a thinner wire – a guitar string actually. Here’s the truck ready to go!!! Here are some M8’s that I enjoyed building. 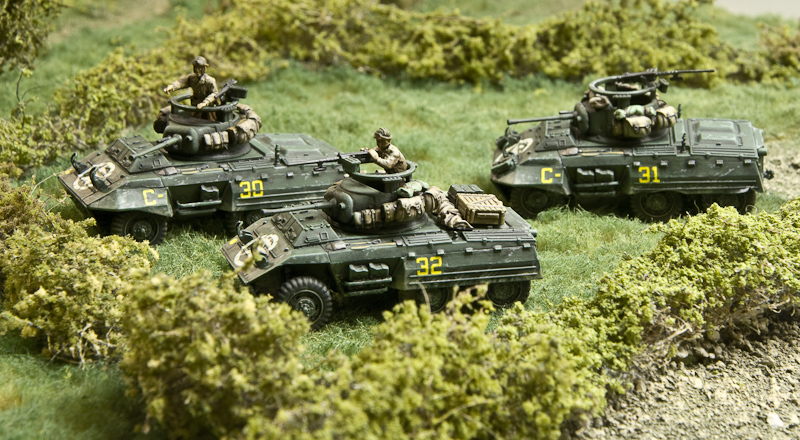 They are from Italeri – a very nice model I must say. The decals was by far the biggest task when making these models! 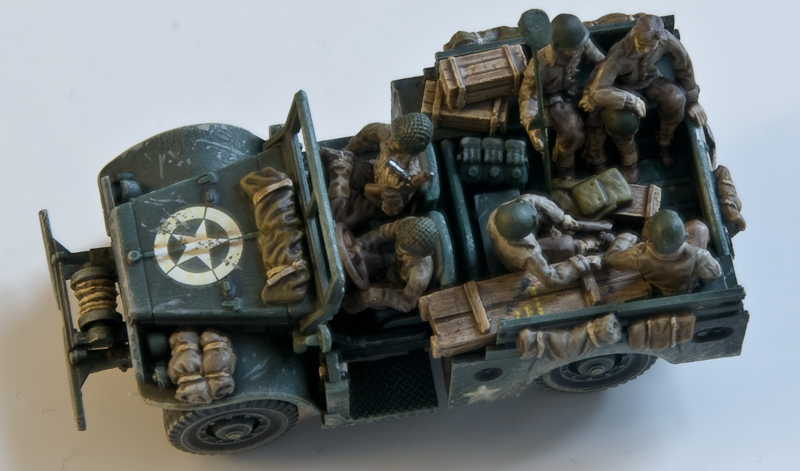 The stars in the front was a living nightmare, I couldn’t get them to stick on the surface as it was not flat – I have tried this before without problems, but this one’s just wouldn’t work, so I ended up drying the transfers and sticking them to the vehicle with a matt coat, which made it a little bit easier. A vehicle registration that should sit on the side of the vehicles was all to big so I skipped them. And the yellow markings also needed a little extra work as you only get numbers for one vehicle (C-30), but this was quit easy to fix with some cutting and painting. A fellow member, on one the forums I visit, pointed out that the US M8’s didn’t have the muzzle flash suppressor, they are now cut off, but that happened after this pictures was taken. As said before, the models are from Italeri. The figures are Milicast, stowage are from Goffy Models and SHQ. 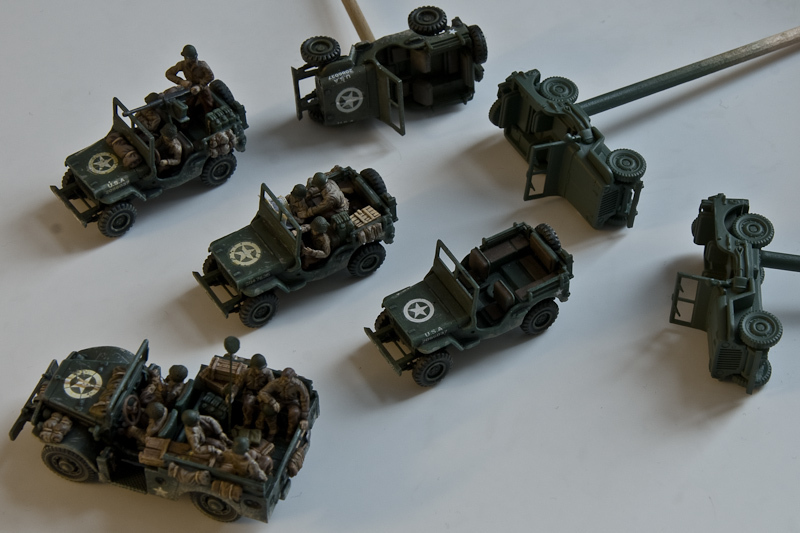 Here are some Jeeps that I am going to use in my Normandy campaign. This is only two out of at least 6. 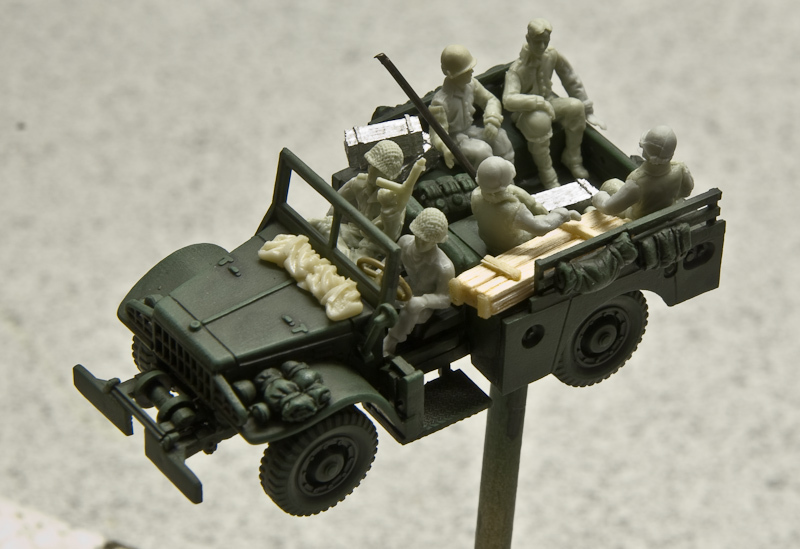 The jeeps that I am going to do will carry different crew. 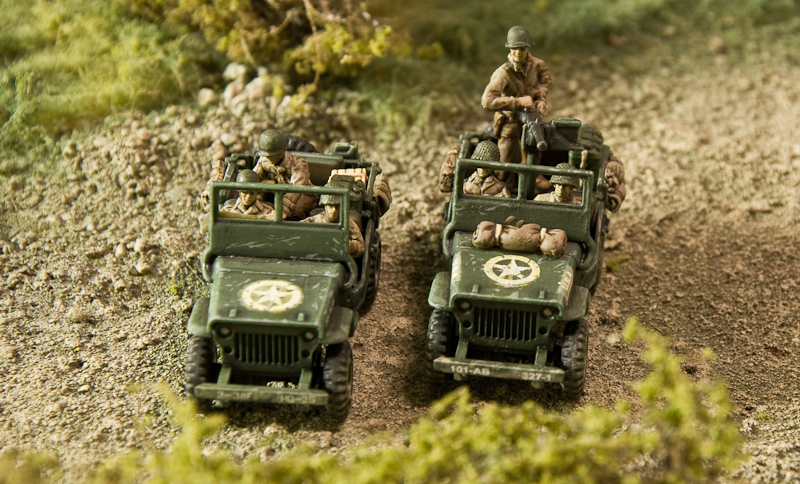 The first two will be one with a Platoon HQ and the other one a with a mounted heavy machinegun. 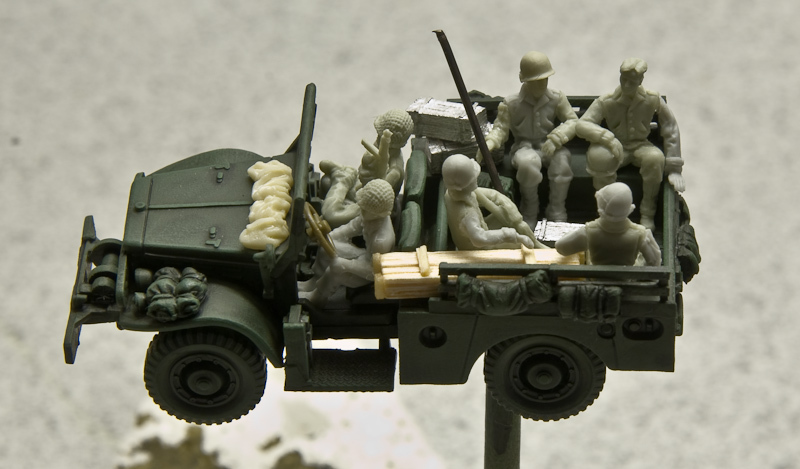 The other jeeps will carry forward observers for artillery support, two jeeps carrying bazooka teams and finally a scout team. 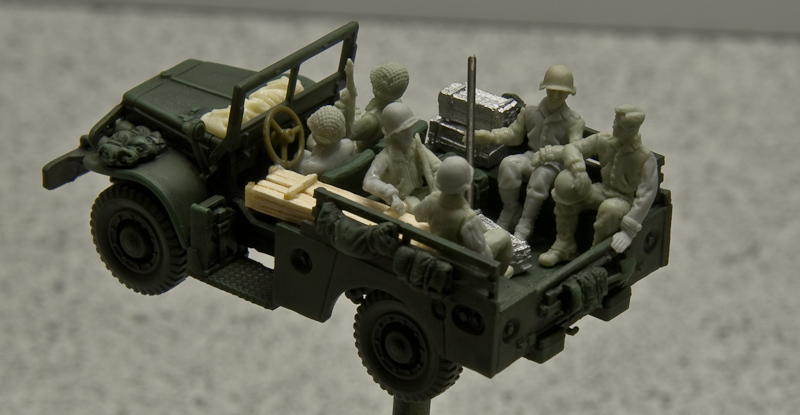 The jeeps are Academy, the figures are Milicast and stowage are from SHQ. 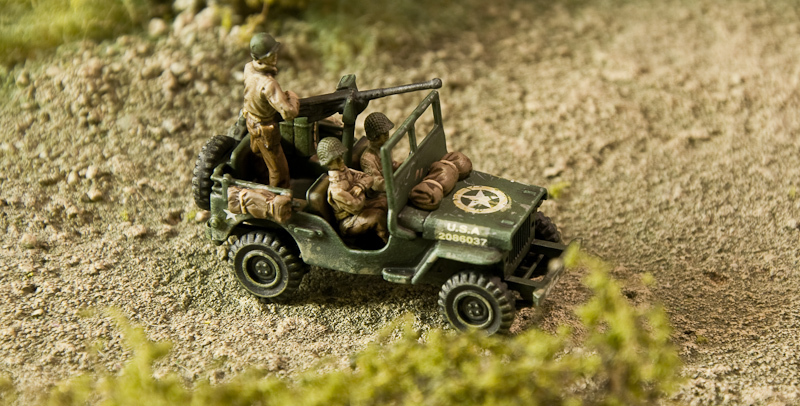 The Platoon HQ Jeep. 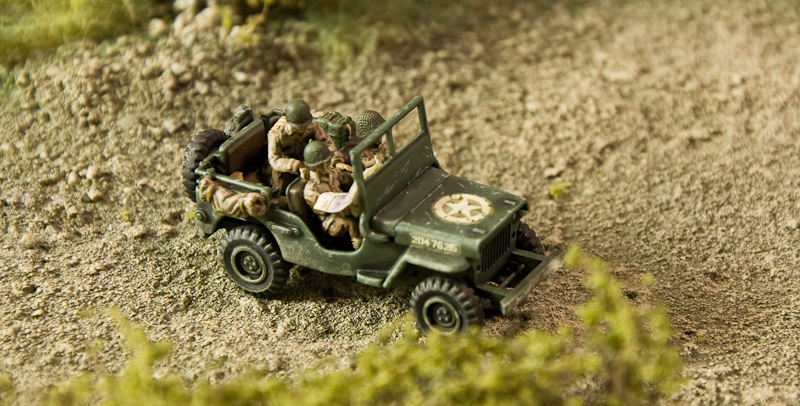 Lieutenant and Sergeant are checking the map. The map some might recognize, an actual map from the invasion (this one), I printed it, folded the map as I would have done was it a real size map and then unfolded it again and glued it to the model. With a light grey marker pen I added some shadows. 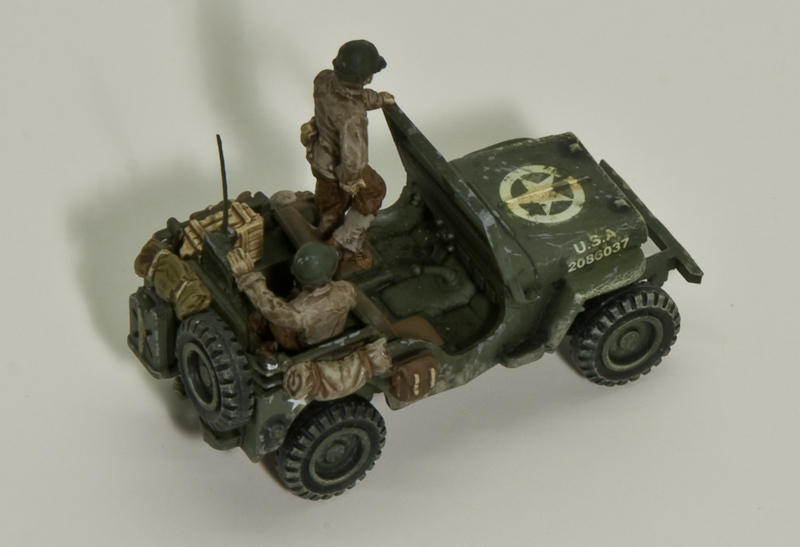 Almost all figures in the Jeeps needed some conversions, especially the Sergeant kneeling – I had to cut both his legs in the knee and foot and one of the legs in the hip to repose him, and then fill the gaps with Milliput. Read about the M8 shown on the picture Here! More jeeps coming up! Read about the M6 Truck shown on the picture Here! 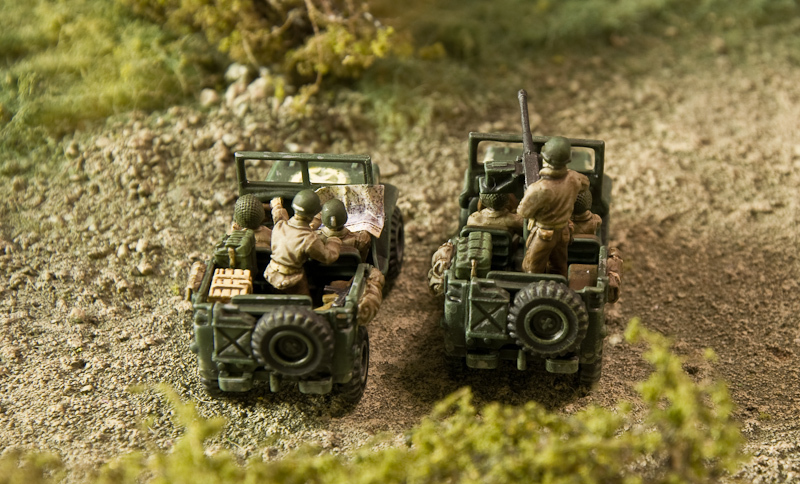 This is one of my ongoing projects that involve terrain making, model building and painting of both vehicles and figures. I will show some techniques (grass, trees and hedges) that I have learned from reading tutorials by Alcal, a super talented terrain builder. As my interest is focused on the Germans against US I will start with the two first mentioned. 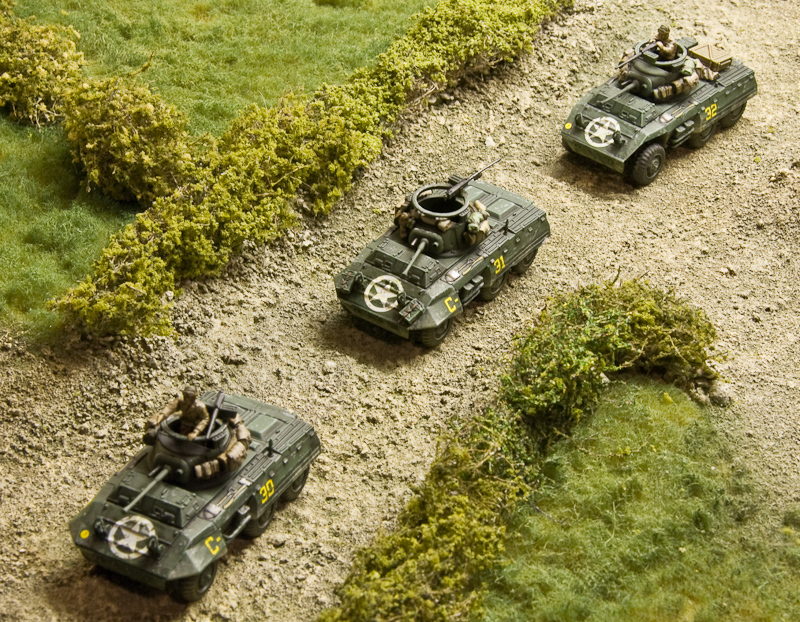 I think when I am ready with building terrain for this two books I’ll probably have all the bocage terrain I ever need. I never liked terrain that is a green piece of sheet with hills, houses and trees glued to a piece of cardboard, or roads and rivers also made out of cardboard. I have a big problem getting in the mood when playing on boards like this. For a couple of years ago I made small pieces of terrains on boards in the size of 30x30cm. This boards could have a house, a bunker, a hill or some trees on it – all fixed to the board. I also made a system for where road and rivers starts and ends on the boards so that they could be put together in lots of different ways. This worked quite well for a while. But the problem was that because of the small size of the pieces there would be many edges that disturbed my eye. Also a slight bump in to the table and all the boards moved around which was extremly irritating. So later on when I started up painting and building for this Skirmish Campaigns Normandy books I also started on a new terrain board system. The idea is still the same but the pieces is much bigger – 60x120cm. Again I have made a system where roads, hedges and rivers starts. I have been using a great amount of time converting the maps of the campaign books to my terrain system. The size I choosed for my terrain pieces works well together with the map sizes in the books. 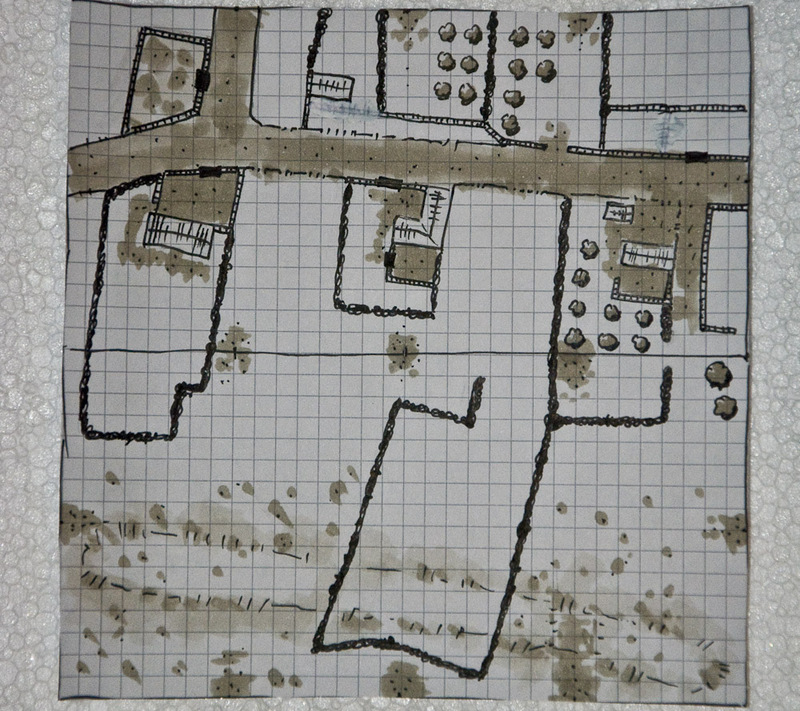 I will show you pictures of my small pieces of maps that I use to make the terrain boards from. And also pictures from the first piece of terrain that is ready. The blue areas is where I can place a hedge and the red is where to place roads. If a road on one board leads up to another board where there is no road, it will look funny, that’s why every place on every board, that can be placed up to a road on a different board, need to have some kind of natural ending of a road – some extra work for me, but by doing so I will be able to combine all my pieces as I want to. The system is not perfect, but after playing around with my small map sketches I guess it will work quite well. 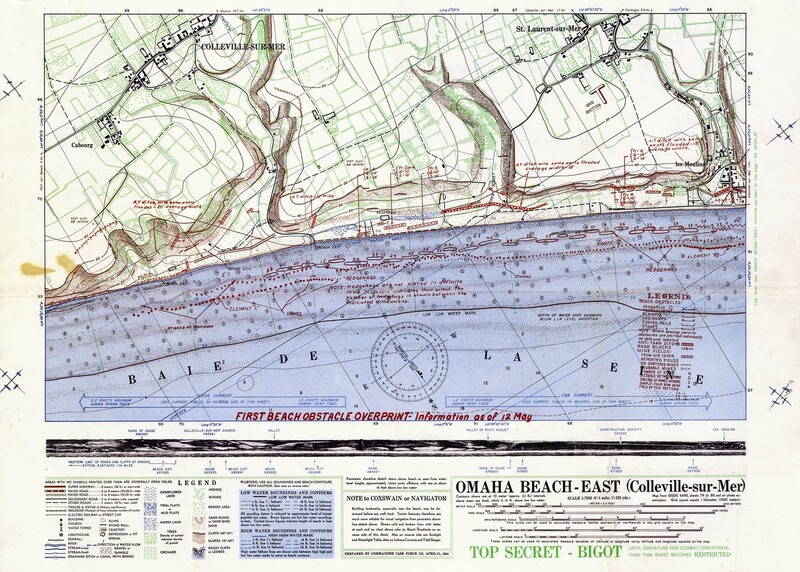 The Ranger Relief map (second scenario in Normandy ’44-Heroes of the Omaha and Panzer Lehr). 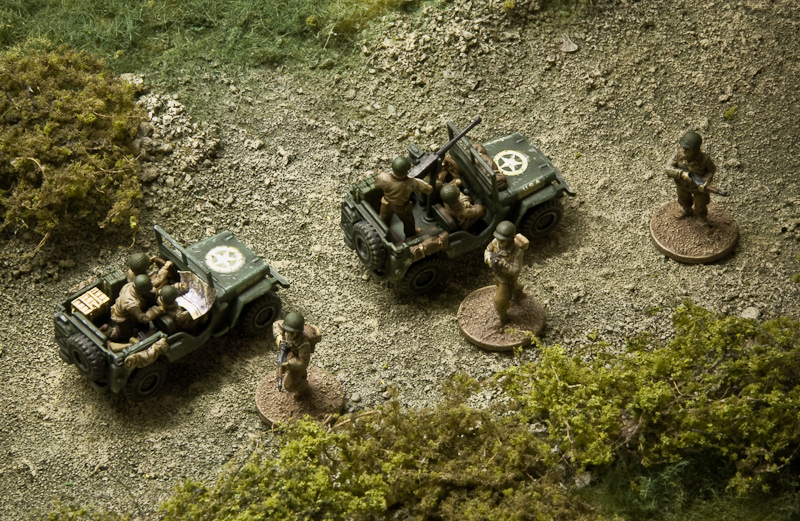 The terrain pieces are made on polystyrene boards. The grass is fake fur (the same type of fabric that is used for making teddy bears), cut down with scissors and a beard trimmer. The stone walls will be the base for the hedges, I used cat litter, a product that when painted looks like big stones and that cost almost nothing. For the road, that is a bit “sunken” I used gravel and sand, when I had carved it out of the polystyrene I needed to make a base to where I could glue the gravel. I made that out of plaster with some sand mixed in it. How high can the “grass” be? I later found out that when painting the grass it become quit thick and therefore hard to place figures in, so the shorter the better. This is after the grass has been painted. I used acrylics and airbrush. The road, stonewalls and waterhole has got their base colour – acrylics painted on with a brush. This is after the road and stonewalls has been drybrushed. To make the road I have first glued gravel on the board all the way upp to the stonewall, and then added sand in the middle of the road. The stonewall which later will have hedges on top of it, is cat litter (8 litre for only 1 euro). 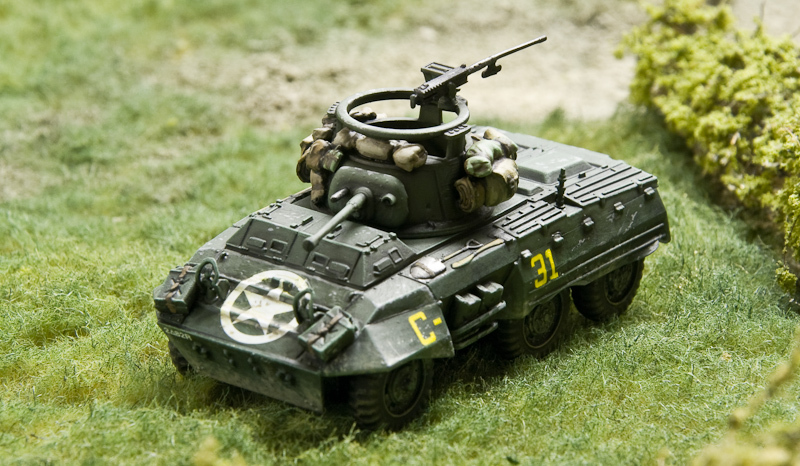 I try “Realistic water” from Woodland Scenics in the waterhole. I hope it dries in a more yellowish colour, right now it is quit milky. 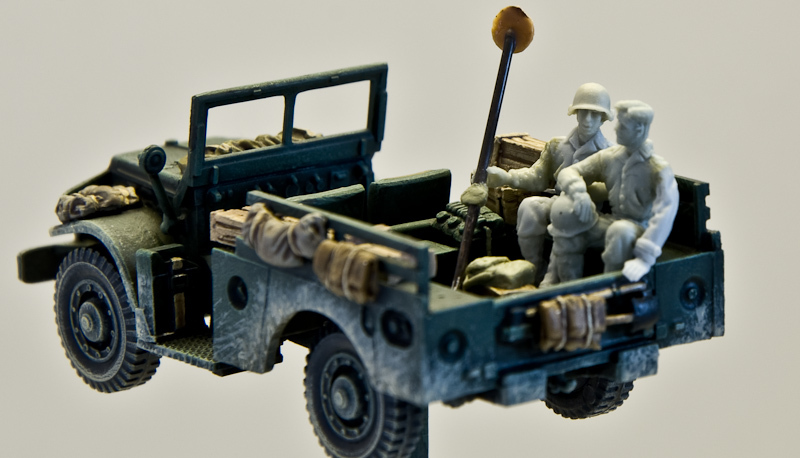 It’s hard not to take some test shots with vehicles and figures on the table. At this moment I’m quit happy with the result. I made more trees than i need for this first terrain piece, some will be used in the bocage, and small trees will be used in the apple orchard. It is quit simple to make them actually. The tree-trunk is made of pieces of branches, the tree-top is made of horse hair mattress glued to the branch and dipped in flock. Here’s some hedges made like I did with the tree tops. The first board is (almost) ready, only thing missing is the house, and maybe some few small details onto it, plus a row of apple trees in the orhcard. This is the next two boards that I’m working on right now. 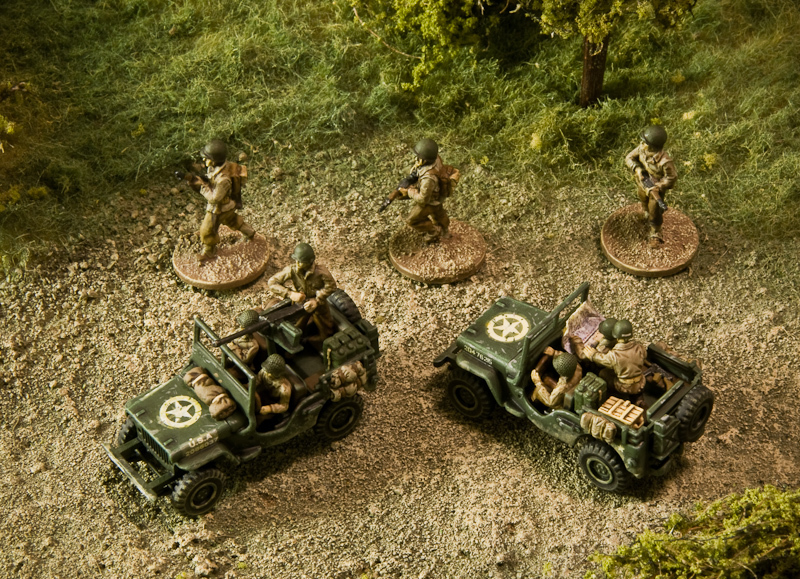 It is the first scenario in the Skirmish Campaigns: Heroes of Omaha and Panzer Lehr. One complain I have on Skirmish Campaigns is the detail on the maps. 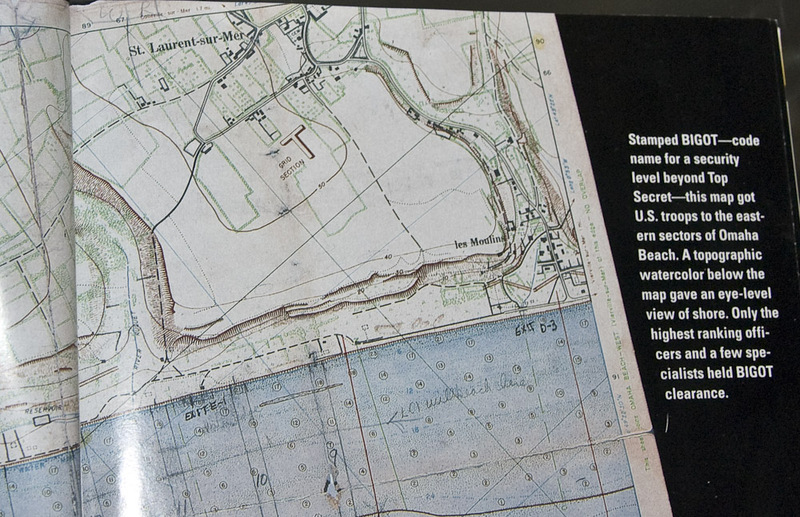 But by following up on the bibliography for this campaign book I found several maps of this spot, one of them was in a article from National Geography, besides that I also found the place on Google Maps, which even if the area doesn’t look 100% similar today, this is still quite useful. With this maps I had a better starting point when making the board. Quite soon I found out that this map should be two boards instead of one, some landmarks that must have played a role in the skirmish was cut out (half of the road for instance), adding an extra board also helped me to get this map working with the system for my boards. Beside all this, doing the needed research for this changes on the map was really fun and gave me a greater picture of how it must have looked like in 1944. The road on the map from the campaign book I guess is Rue du Val. On my boards the part of Rue de Val that is present is from the crossing Rue de Val/Le Laquais to the house in the bottom of the yellow field, this house is also one of the objectives in the scenario. Try to scroll up a little bit on the map and see how close this is to the beach. This is how my map ended up looking like, not exactly as in the real world, but still more detailed than the map in the campaign book. 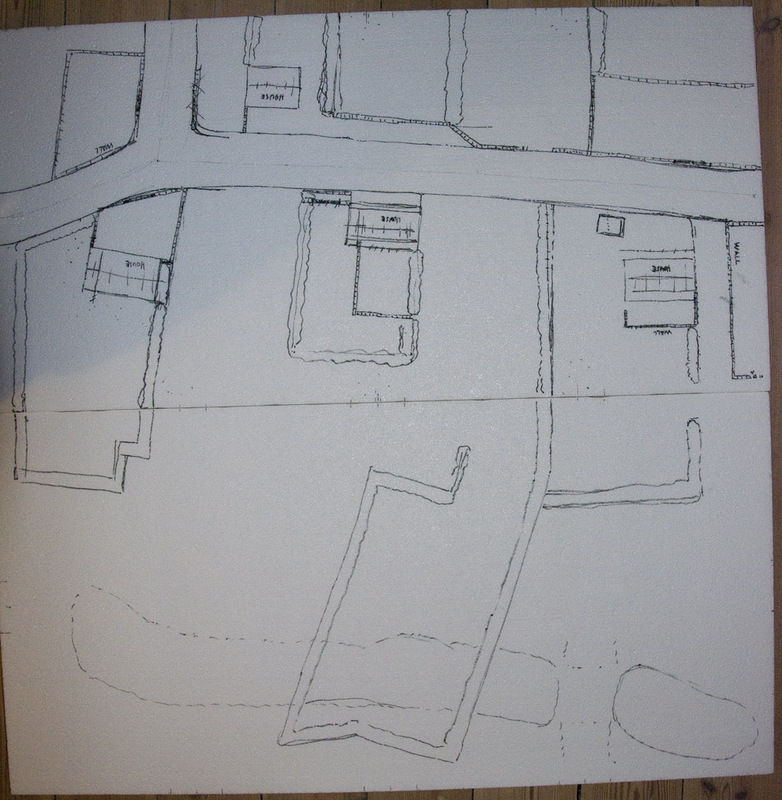 Here I have drawn the map onto the two boards… Just after this picture is taken, I carved the sunken road into the polystyrene and added a layer of plaster to the surface where I can glue my gravel and sand. The sunken dirt road (that does not look very sunken on the picture) has been getting a surface of gravel and sand. 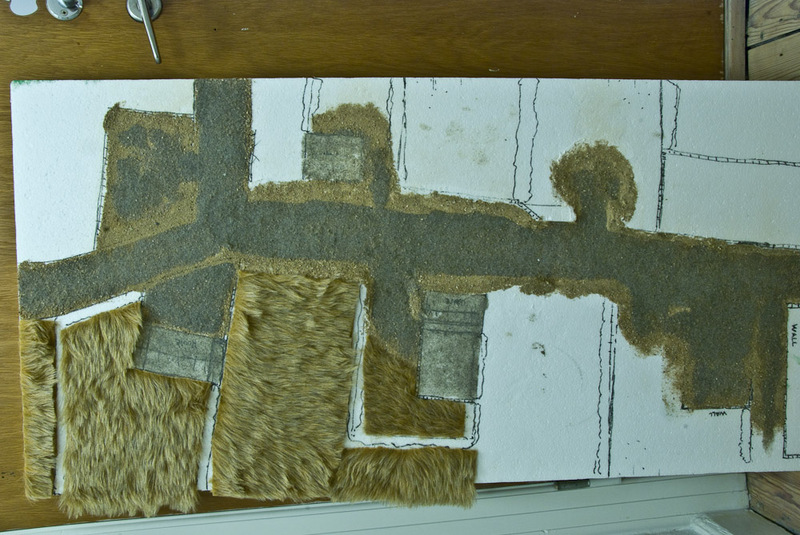 I have started to glue fur onto the board too. This is the first I show on my terrain. There will go a couple of months before we have moved to our new apartment and I again can work on the terrain!